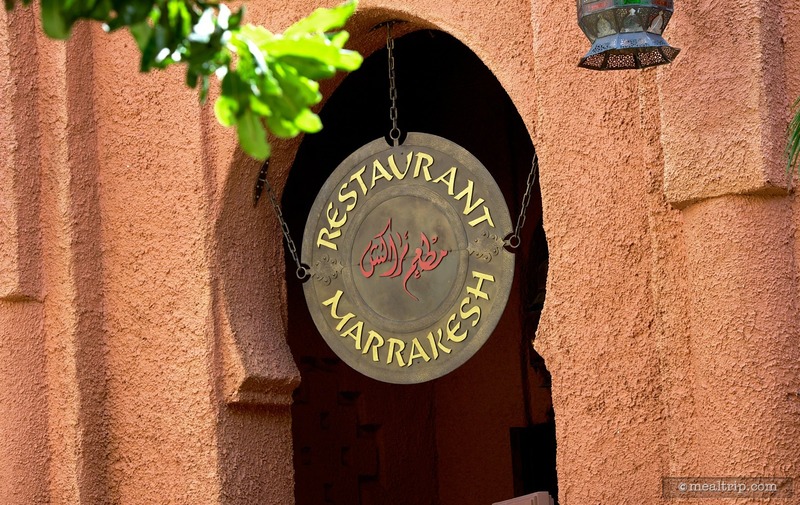 Restaurant Marrakesh is located in the back of the Morocan pavilion at Epcot, and the immersive walk down to the restaurant, past a few shops and bizarres, might just leave you thinking you're in Morocco. 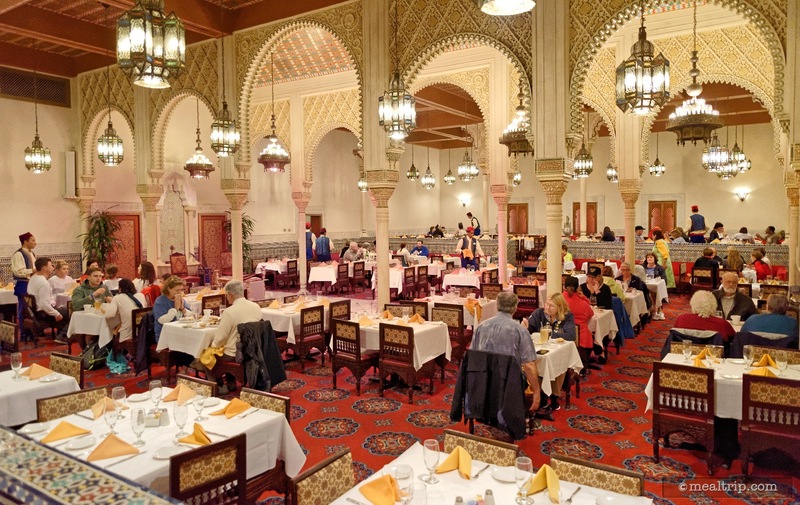 The interior of the restaurant itself might seem a bit sparse from a design standpoint, but the wall and floor tile mosaics and patterned carpet are very authentic to what one might find in a large dining hall. Appetizers range from harira soup and seafood bastilla to assorted mediterranean salads and unique goat cheese with crispy bread for two. 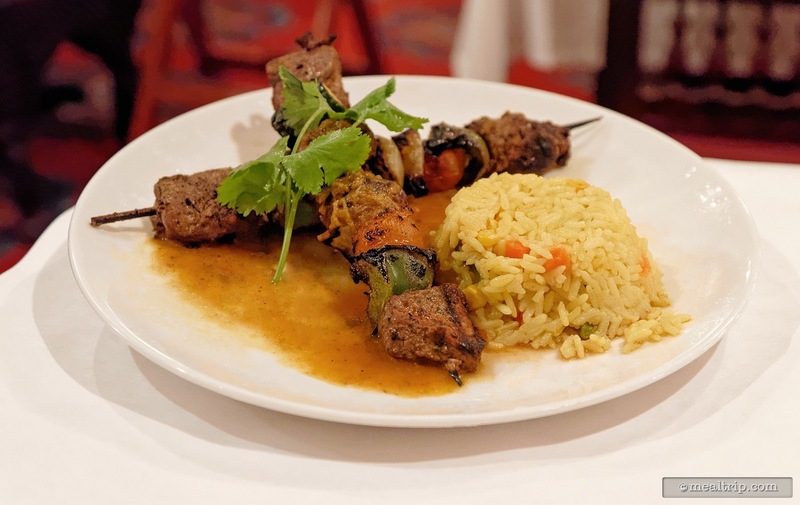 Traditional Morocan entrees include a roast lamb meshoui, a steak or chicken shish kebab, and couscous with many different meat or vegetarian options. Various baklavas are available for dessert along with the surprisingly delicious bastilla (crispy leaves of pastry topped with vanilla cream and sprinkled with toasted almonds). 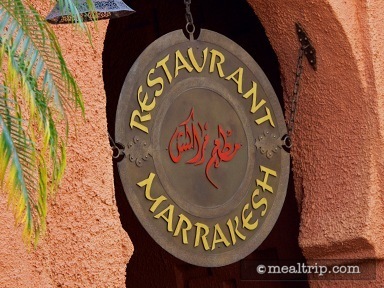 Restaurant Marrakesh is one of those dining locations at Epcot where you can always count on getting a table… even without reservations on most days. Not to be confused with the newer Spice Road Table restaurant which is smartly placed directly on the World Showcase Lagoon, or the Tangierine Cafe (which is located directly across from the Spice Road Table)... Restaurant Marrakesh is tucked way back in the Morocco pavilion, and is a table service restaurant (with waiters and waitresses). This rather unfortunate location may be one reason for the lack of patrons. Even at Epcot, foot-traffic matters. The restaurant now places (what seem to be a quite shy, but beautifully dressed) cast member out in the middle of the World Showcase walkway to entice guests with a picture-book of entrees and menu selections. Unfortunately, suspicious guests seem to steer clear from the area thinking it might just have something to do with time-share sales or a discount ticket racket. The few that do stop by and look at the offerings, seem to peruse the menu, make polite conversation, and then move on. While I do not make a habit of eaves-dropping, you do occasionally hear guests say things like "I make shish kebabs on the grill at home at least once a month, and they don't cost $30 a plate". Which may be another unfortunate reason behind the lack of interest. It's not that the prices are terribly out of line with what's being charged elsewhere in the parks, it's just that the rather Americanized versions of Moroccan cuisine that are being offered, just read and photograph more like common, simply prepared things that we all make at home. Sure, the flavors and spices might be a bit different, but you really don't get that from looking at the photos or reading the raw ingredient style menu. A shish kebab, is a shish kebab. Sadly it seems, none of the kebab entrees really do much to elevate themselves from the ones you might make at home, and they are basically exact renditions of what's written on the menu. The quality of the kebab meats on one of my recent visits wasn't even all that high. At nearly $30 a plate, you do expect, at the very least, to get well trimmed, fall off the skewer, beef. Not wanting to dwell on the negative, the Roast Lamb Meshoui dish gets high marks for being visually stunning, and quite tasty (but not overly spicey) if you are in the mood for lamb. I have also found the Mogador Fish Tagine to be consistently good. Here again, it's not a complex dish, but the marinated white fish is served in a way that very nearly makes me think of it as a deconstructed fish stew, just waiting to get mixed up as I please. Now, you may be wondering why my somewhat high scores for the restaurant... don't seem to match up with what I'm writing. It's because I'm about to share a secret about how to make Restaurant Marrakesh a better culinary and entertainment experience. When you go… just don't order any of the entrees! The appetizers at Restaurant Marrakesh are amazing… while not exactly being "authentic" Moroccan cuisine… they really are tasty small dishes. Don't use your dining plan credits that force you to get an entree… order a wine flight or specialty cocktail, pay out of pocket, and get four or five appetizers for your table. Pretend it's a small plates food festival, because most of the appetizers have more flavor, and are more unique than the entrees. From the tomato and beefy goodness of the Harira Soup, to the unique Seafood Bastilla, which is like a savory seafood baklava filled with grouper, shrimp and mushrooms… they are all really flavorful. 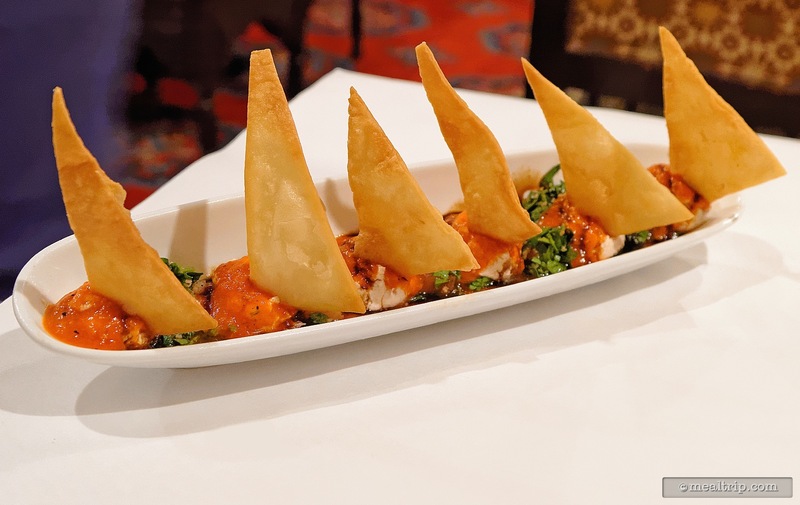 The Goat Cheese with Crispy Bread strikes a great balance between the cool, smooth cheese and the red pepper sauce, tabouleh and a balsamic reduction. I have also seen the caper and saffron cream "mussels casablanca for two" being hoarded by "one", once they've made it to the table. Mussels aren't really my thing, but I've seen it happen. I have… eaten the Goat Cheese with Crispy Bread for two… by myself. As great as the appetizers are, the desserts (like the entrees), seem a bit lackluster... with the exception of the Bastilla. 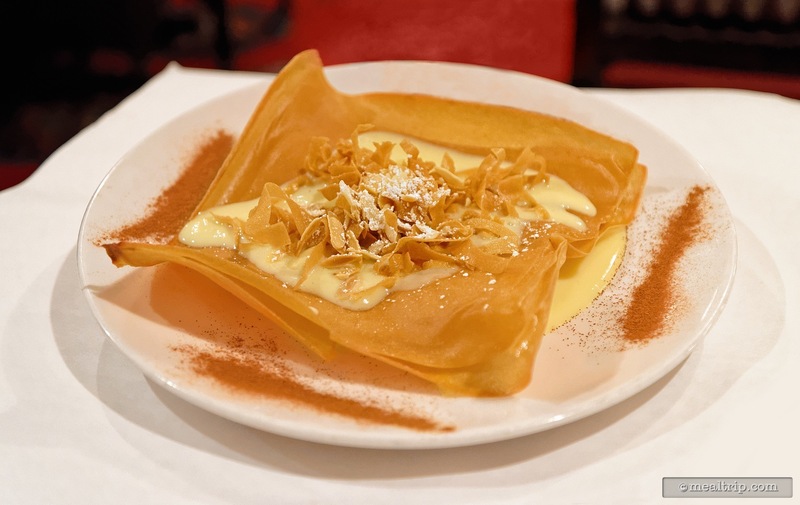 While I have never seen a presentation like this one, I would mostly liken this unique dish to a traditional Ktefa, where crunchy warqa (or phyllo dough) is layered with fried almonds and an orange custard cream anglaise, then dusted with cinnamon. I actually wouldn't recommend any other dessert here, not because they're "bad" per say, but really, where else are you going to get a fresh Bastilla? The environment inside the restaurant is authentic, with very high ceilings and carved detailing on the columns. Service, has been a bit inconsistent at times but for me… it's been more okay, than not. There is a huge cultural and language barrier there. I know it shouldn't really be your job as the patron, but taking the time to ask where your server is from, or learning a few words of Moroccan or French will go a long way to breaking the ice and making the experience more fun. Depending on where you sit and when you go, it can be peaceful, or quite the opposite. There is usually a two piece band and belly dancer that entertain in the very center of the restaurant at various times. If you want to be in the middle of the action, request a table close to the center. If you are looking for something a bit more peaceful, a table on the outskirts of the very large main room might work out better. All in all though, Restaurant Marrakesh gets decent marks from me. I like the place. Unless I wanted lamb or fish though, I'd just get a couple of appetizers and a Bastilla for dessert. 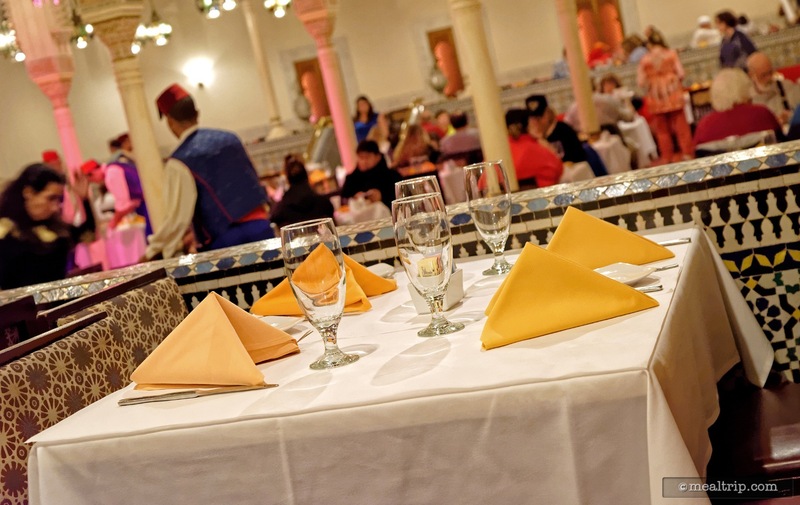 If you find yourself at the back of Epcot with no reservations, and want to sit down and get away from the crowds, Restaurant Marrakesh is worth checking out.